Monolake Ghosts in Surround presents the material of the Ghosts album as a full surround sound experience plus real time generative video. The visual side of the Ghosts in Surround tour is a contribution by the Dutch audiovisual artist Tarik Barri [NL] with whom Robert Henke [DE] is collaborating since early 2009. Robert Henke, born 1969 in Munich, Germany, is a composer, sound designer, software developer, installation artist and audiovisual performer. His art is focused on carefully shaped details and gradual changes of repeating structures in different time scales. Henke places equal importance on the interaction between audiovisual arts, and the physical spaces in which they take place. He is exploring new technologies such as wave field synthesis and ambisonics, and makes use of large-scale high-resolution projections or lasers ystems to create situations of total immersion and either decouple the spatial experience from a given space or enhance its inherent properties. Many of his works are defined as potentially endless and slowly evolving states, thus inviting the audience to immerse themselves completely for a freely defined amount of time. His sonic explorations are rooted in academic sound research and computer music as well as in contemporary club culture. 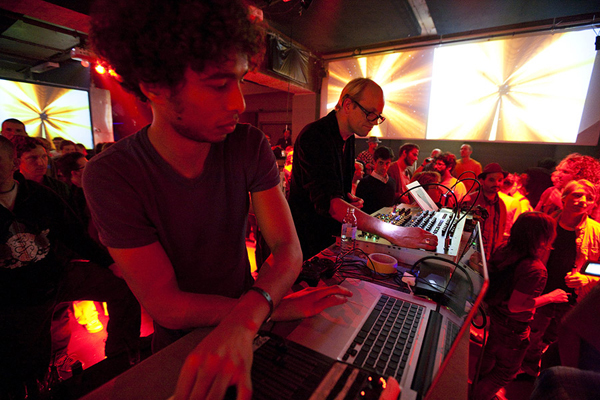 With his collaborative musical project, Monolake, he helped shaping what later became ‘the sound of Berlin techno music’, whilst his more conceptual works are frequently performed or exhibited at art galleries and festivals. Henke’s contemporaries include a growing group of artists who use technology and computer science for the exploration of new aesthetic territories between composition, performance and installation. For Henke, the artistic results that are evident in his works – as well as creation of the instruments and tools necessary to achieve these results – are two sides of the same artistic process. Henke’s interest in the combination of art and technology is further evident in his contributions to the development of the music software, Ableton Live’. Since Ableton’s founding in 1999, he has been central to the development of Live, which became one of the standard tools for electronic music production and completely redifined the performance practice of electronic music. Henke also writes and lectures about sound and the creative use of computers, and holds a professorship in sound design at the Berlin University of Arts. Henke’s performances and installations have been shown at the Tate Modern in London, the Centre Pompidou in Paris, MUDAM in Luxembourg, the PS1 in New York, the Art Gallery of New South Wales, Sydney, the Experimental Media and Performing Arts Center (EMPAC) in Troy, the Sonar Festival Barcelona and others. Henke has released more than twenty albums, and his work Layering Buddha, received an honorary mention at the Prix Ars Electronica in 2007. For 2013 he has been selected as Morr Visiting Artist at the music department of Stanford University, where he will be teaching a class in computer music composition and performance.